JOIN OUR FIVE-DAY SUGAR FREEDOM CHALLENGE! LEARN HOW TO OVERCOME CRAVINGS & ENJOY SUGAR-FREE FOODS WITHOUT COMPROMISING TASTE! If you’ve been following me for awhile or read my “about me” page, you know that I’m totally a recovering sugar-addict. Yuup. Growing up I loved healthy, fresh meals but also LOVED sugary baked goods, chocolate, candy and just all of the high-carb treats. Legit. Put a Reese PB cup in front of me and see how strong my will power is… yeah spoiler alert: ahh not that strong. While the craving struggle was always very real for me, I also wanted to live a healthy lifestyle. So I've made it my mission to re-create my favourite foods with healthier alternatives without compromising taste. I don’t think that deprivation should be a thing! Cause listen, there’s no way I’m giving up chocolate, it’s simply not an option for me. What is life if there is no chocolate? LOL dramatic much? I think not. But in all seriousness, all you have to do is make a little changes over time and you’ll even start to crave those healthier versions of your fave desserts/meals because you won’t feel tired, bloated or guilty. Not to mention the underlying health reasons why you crave sweets in the first place - when you become mindful of how much sugar you’re putting into your body, you can then take control on your cravings. Spotting hidden sources are so important here! And now I want to share my kitchen creations and knowledge with you! Totally FREE of charge. This isn’t just a five-day meal plan with delish recipes. 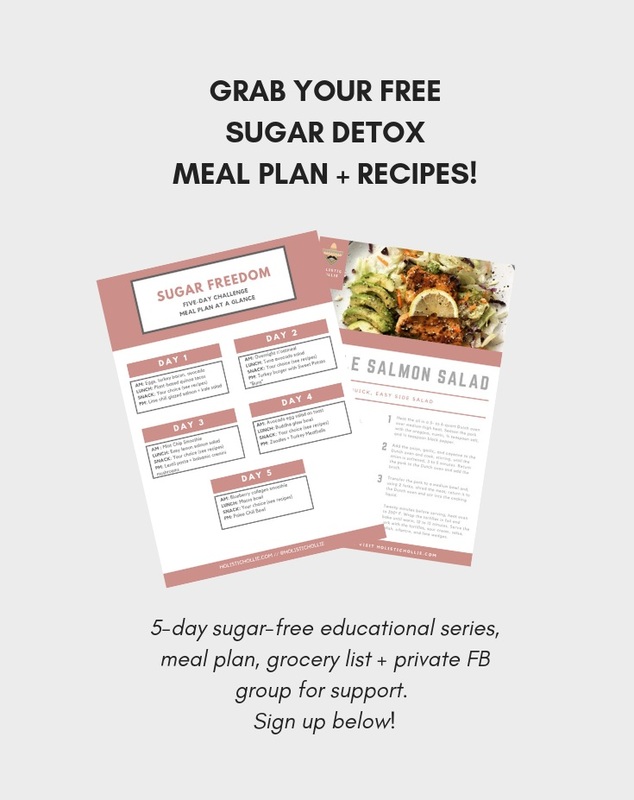 This challenge is all about providing you with education and a supportive community to help you along your journey of living a sugar-free life. ‘Cause let’s face it - quitting sugar is tough! When you opt-in, you’ll immediately receive the 25+ page meal plan, grocery list and recipes to prepare for the challenge that will start three days after you opt-in. IMMEDIATE EMAIL: Meal plan + grocery list + 5 days of recipes. Sign up below and get your FREE meal plan, recipes and your 5-day educational email series allll about curbing sugar cravings. Let’s do dis! Thank you so much! Your meal plan and recipes are on their way to your email as we speak. Note: it may take 5-10 minutes to get to your inbox.